This is the Chicken Casserole to end all chicken casserole recipes! Creamy and delicious but also so easy to make- this is the perfect way to feed a crowd! Today’s recipe is one I’m so excited to share, and in our family, the stuff of legend’s. My Aunt Fern is a pretty fantastic cook, and her easy Chicken Casserole is tasty and comforting dinner that dreams are made of. This creamy Chicken Casserole is an excellent option for feeding a crowd, because it makes a pretty big portion. 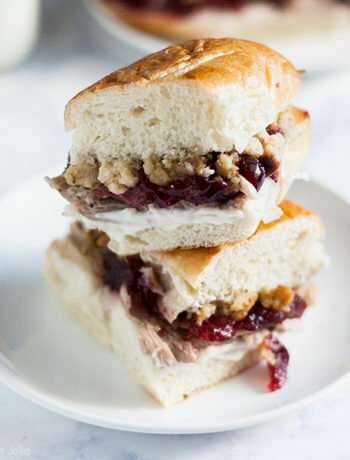 It is so good, that they actually served it at both my bridal and baby showers (my only regret was not taking a bigger portion of the leftover home!). I know it’s tempting to skip boiling the chicken and substitute with a rotisserie chicken and some store-bought broth. While I would normally be totally on board with making these substitutions, this particular recipe was designed to cook the chicken and then use the cooking water in the casserole. I strongly encourage you to avoid substituting on this part. Make sure you’re tasting everything as you go. Although I provide measurements, like every good family recipe this one was always done by taste and not exact measurements. So taste it and adjust everything as you go. When you mix all the casserole ingredients together, it’s going to look pretty soupy. Don’t let this make you nervous- you want a lot of liquid because as it bakes, the casserole will absorb the liquid and you don’t want it to dry out. The good thing is, the first half of baking is done covered. So when you remove the cover, you can check and see if it’s drying out. If it is, add a little more of the cooking juices before topping with the corn flakes. My favorite piece of advice is to put a little hot sauce on it. My sister and I love to do this when we eat this. Can I make a smaller batch if I’m not looking to feed a crowd? Yes! The original recipe is designed to be made in a two 4 Quart Baking Dishes . But you can always halve the recipe and use one 4 quart baking dish. I make it in a 9″ x 13″ pan and put the remaining in my 8″ x 8″ baking pan. What if I don’t eat nuts? The nuts are totally optional, you can leave them out and still have a perfectly delicious chicken casserole (my aunt always made a smaller nutless-batch for my Grandma who couldn’t eat nuts). Can you freeze Chicken casserole? Yes! be sure to cover it well. How long does chicken casserole last in the refrigerator? About 3-4 days covered. How do you reheat chicken casserole? Either in the oven or the microwave. Preheat the oven to 350 degrees and grease two 4 quart baking pans (or 9" x 13" and 8" x 8" pans) with cooking spray. Boil chicken in 4-5 cup of water for 1 hour and then cool slightly. Bone chicken, shred and set aside reserving broth for later. While chicken boils, cook instant rice as per package directions. In a large bowl, combine chicken, rice, mayonnaise, cream of chicken soup, sour cream, garlic powder, slivered almonds, celery and hardboiled eggs. Stir well. Taste this mixture and add salt and pepper if needed (or add a little more of other ingredients if you feel they're needed). Stir in 3 cups of broth and add 1 more if necessary (you want it to be soupy since the rice absorbs so much liquid during baking). Pour mixture into baking pans and cover with foil. Remove the pan from the oven and uncover. 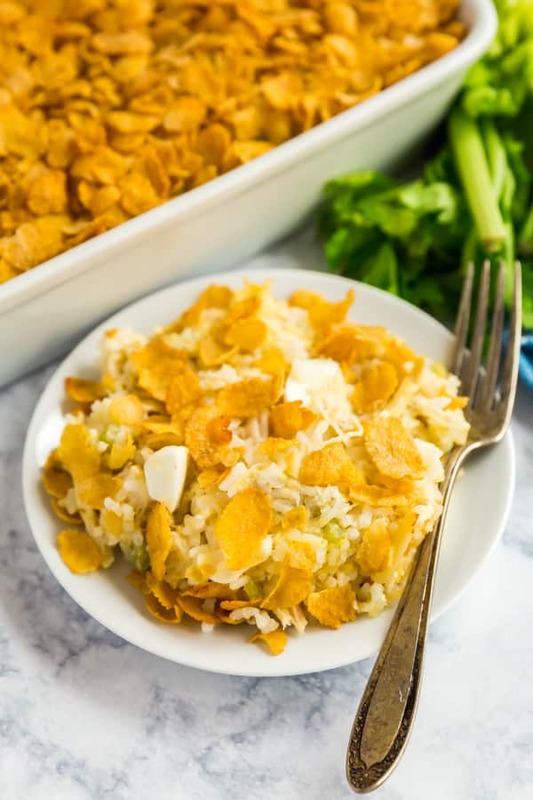 Look at the casserole and if it looks like it's too dried out, ladle a little more of the chicken cooking broth over the casserole to moisten a bit before topping with corn flakes. Bake uncovered for an additional 30 minutes or until heated through and bubbly. Serve immediately. I recently found out that my aunt actually bakes the chicken with the water for an hour for even better flavor (this was obviously after I made the video). So you can do that for an even more hands-off approach to cooking the chicken and for even better flavor. I'd go with a 350 degree oven.